Screens — International Etching, Inc. This screen is .020″ 316L stainless steel. 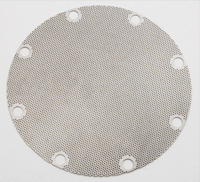 This type of product is a natural and simple application for photochemical machining. Diameters are .025″ +/- .002″ on .050″ center lines with rows staggered at a 60° angle. Hand punching tooling would have been exorbitant. Laser cutting CAD programming would have also been costly compared to etching. Note that all the holes are clean, sharp, and burr-free with no heat affect zone. Reordering would incur no tooling or set-up costs. Short run of 45 pieces. Shipping time: 7 business days from receipt of order.